“840” tag options are also available. 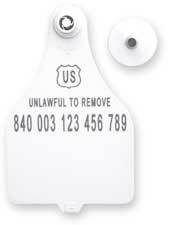 The “840” tag is an official ear tag for all States that can be used for all regulatory programs such as interstate commerce, disease control programs, etc. The U.S. shield is printed on the front of the tag and the tag back. “Unlawful to remove” is printed on the back. 840 tags are printed with a 15 digit unique animal ID number beginning with the number scheme 840 which is the USA country code. If you would like to utilize “840” tags you must have a valid premise registration number that is issued through your state animal health office. Tag numbers allocated to you will be uploaded to the Animal Identification Management System maintained by USDA Veterinary Services. 840 tags are available in white or yellow. Visual ear tags may be custom printed with a management code and a line of text. Customization of studs is not available for 840 tags. 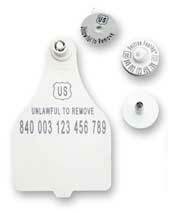 840 tags are available as tamper-evident visual ear tags, RFID e.Tags and Visual ChoiceSets. General information about each tag type can be found below. Reminder: Breeding stock over 18 months of age should be identified with an official ID when moving interstate. In 2019, USDA will discontinue the free metal clip tags that meet the official ID requirement. Tamper-evident electronic ID or RFID tags will become the official ID moving forward. Currently some states require official 840 coded RFID tags in breeding stock when they enter the state. Please check with your state vet prior to shipment of breeding stock. (USDA Press Release 9-25-18) Click here for more information. Duflex tags can be printed with numbers and optional graphics by laser. Customized options are virtually endless, ranging from simple name or number imprints to logos and brands. All visual tags come with a standard black stud. If you would like to custom print the tag stud, the stud will be black with white printing. Markings on the stud must be text or very simple artwork. Logo fee is $37.50 for each unique piece of simple artwork. Logo on front of tag – One-time fee of $37.50 and $0.14 per tag. Logo on the back of the tag - One-time fee of $37.50 and $0.29 per tag.